The ghost of Gimghoul Castle doesn't actually belong to the castle itself. In fact, the ghost was there long before the castle. The ghost belongs to a bloodstained rock. According to legend, Peter Dromsgoole died and was buried beneath this bloody rock and his ghost still haunts it to this day. Peter Dromsgoole went to The University of North Carolina at Chapel Hill in 1831. Like many young college students, he met and fell in love with a beautiful young woman at school. The woman's name was Fanny and the two young lovers were inseparable. Sadly, Fanny had another admirer. Her beauty was well known and another man decided that Fanny should be his. Peter's rival challenged him to a duel for Fanny's hand in marriage and Peter accepted this challenge. They chose the spot for the duel on top of Piney Prospect. This was a hill not far from the University. The two met at dusk and shots were fired. Peter Dromgoole was shot and fell on the rock on top of Piney Prospect. His blood seeped into the stone and has never left. Murder was a crime, even then, so Peter's rival decided to quickly cover up his treacherous act. He buried Peter beneath the blood soaked rock and made up a story about Peter running away to join the Army. Fanny never believed the lies. According to legend, Fanny saw Peter's ghost atop Piney Prospect and would go there ever day to wait for her phantom lover. She sat there so long that she finally went mad and died on the rock beside her love leaving her ghost behind. Peter's killer confessed to his murder on his death bed sixty years later. 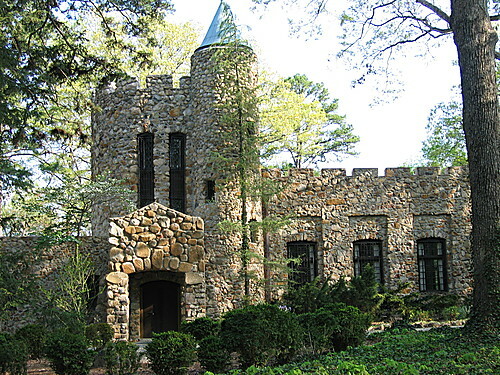 Gimghoul Castle was built beside the bloody rock on Piney Prospect in 1926. The castle is a place of mystery and shadow. It is the house of a secret society that originally named themselves after the infamous Peter Dromgoole. The founders of this organization believed Peter to be the embodiment of Arthurian ideals of chivalry. They later changed their name to the Order of Gimghoul in "accordance to midnight graves and weirdness.". 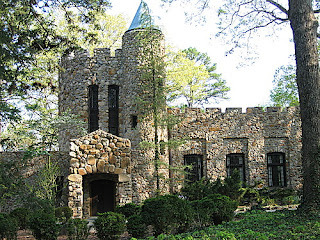 The castle is a dark and mysterious looking place and the ghost stories have bled over to include the castle as haunted. However, by most accounts, the ghosts of Peter and Fanny have always been seen on the bloody rock waiting for each other in the dark. cool! i'd not heard of this story. is the castle still in use today? Yes! Its still used by the Gimghouls society. I just love them old castles. They are so creepy, cold and full of ghost stories.